This is a great time for someone to test out a new character, or for player that have been taking a vacation from Norrath to get to caught up to their friends when joining them on their server. Never played EverQuest II before? No problem! This promotion is also available to new accounts if they have an All Access Membership! Being a member has its perks, and you can learn more about membership benefits here. Once you log in, the Level 100 Boost Bauble can be found in your claim window. All you need to do is log on to the character you want to boost to 100, and then hit /claim to add it to your inventory. Then when you unpack the Proving Grounds Level 100 Boost crate your character will level up to 100 and you will receive a set of gear so your character is ready to go! Curious about what else is in GU103: The Menagerie? See the post here. 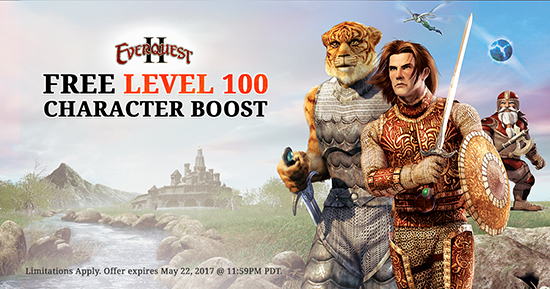 *The free character boost promotion is for Daybreak accounts that are in good standing and have logged into EverQuest II prior to 04/20/2017. See, I really wish when Daybreak has promotions like this they do at least a 25% discount on the current expansion. Lots of people are going to be logging in during this time that haven’t in quite a while and I feel like they’re really missing out on retaining those players but not discounting the current expansion. I’m confused. I logged in last night, saw the boost in /claim and thought “Great! It’s a claim so I don’t need to do anything. I can just grab it whenever I need it”. I was planning on saving it until such time as i might have a use for it. Are they saying it will vanish from /claim after the 22nd? If so, will it then also vanish from inventory if it has been claimed but not used? Is it Heirloom or No Drop? If I have to log in all seven accounts and boost a character on each before the 22nd then I will but I’d rather just keep the option in /claim and get around to it whenever it seems appropriate. The claim bauble is Heirloom. Based on the last time they ran this promotion, the bauble will almost assuredly disappear from /claim when the promotion ends on May 22nd. I don’t know whether the bauble will remain in inventory after May 22nd or not. My guess (and it is purely a guess) is that the bauble will also be removed from everyone’s inventories at that point. As I see it, it’s better to err on the side of caution and use it early, unless you have it on good confidence that the bauble will linger afterward. I started playing again in January and got the 100 lvl boost in that expansion on all 4 of my accounts. I used the 100 lvl boost on only one account so far. I looked in all my /Claim window yesterday but only see the new 100 lvl boost in the account that did not have the original from the expansion I paid for. How will I get the new 100 lvl Boost in the other accounts that still have the original 100 Boost? This should give me 2 100 lvl boost on the three accounts. Do I get 2 one my one account or just 1 ?